The new and improved Super Momma has a laundry room with a door, and the clean clothes are in a clean pile most of the time. She might have baskets she and the kids playfully and haphazardly sort the clothes into in a very basketball game-like way. Or not. If the Super Momma is going to fold clothes, she’ll do it on the couch watching a favourite movie or when someone has come for tea… guests will usually start helping. The new and improved Super Momma puts ‘Ditto” up in lights on their home that is next door to an extravagant Christmas light display. In Spring, she posts a ditto sign in her one thriving shrub, pointed towards her neighbours fully landscaped, tweezer pruned yard. The new and improved Super Momma yells, “Honey I shrunk the kids!” after hiding the kids in a closet, and takes one moment to give her husband a passionate kiss before the evening chaos begins, and calls that ‘relationship connection’ done. The new and improved Super momma goes to yoga. If she likes yoga. But sometimes Mommy Brain kicks in and she ends up at a coffee shop instead, sipping lattes and reading a good book. “Sheesh, how did that happen?” she wonders. The new and improved Super Momma picks one night a month to do things she wants. She knows Full Moon is a good choice; family be can more easily convinced to support her outing because Full Moon can make people act oddly and they wouldn’t want to mess that. Not only that, if her family happens to be the ones acting oddly during full moon, she gets to escape. The new and improved Super Momma looks at her kid/s and says out loud, “Dang, you are precious!” even when they are dressed funny, the felt pen won’t wash off, and they’ve been whiny all morning. She notices she just feels good saying it. That, and she loves watching the older kids’ bewilderment when they know they weren’t being all that precious. The new and improved Super Momma passes the buck. When it’s hard for the kids to do their chores or homework, she makes a habit of asking them “How can you make this fun?” and then she trusts that the children have an inner wisdom and innate playful creative side and they can come up with an answer. The new and improved Super Momma models ‘doing things differently’ proudly, knowing the ‘old ways of the 50’s to 2017’s caused overwhelmed, over-guilted, under –funned mommas. The new and improved Super Momma models imperfection proudly, knowing she is changing the world one small imperfection at a time. Posted in Creative Parenting and tagged being mom imperfectly, family, help for moms, too much pressure on moms. Bookmark the permalink. I don’t know what’s really going on in her class. She is in an arts-based school. But, it frightens me that this is her perspective. I hope today is different for her. I really don’t want either of these quotes to be true anymore. Posted in Brilliance of Babies and Children, Creative Parenting, Creativity and tagged creativity and children, Janet Whitehead creativity coach canada, Robert Epstein, scientific american mind creativity edition, value of creativity. Bookmark the permalink. Painting Spills and Aha’s – Recipes for Creative Play. Nutritional information: This project for family and friends is a great way to get past the paralyzing perfectionism that can happen when you show up to ‘creating.’ Enjoying the process and letting go the outcome makes this a freeing and fun event. Be sure to remind yourself and others that the paintings have potential to be really ‘bad’ and that’s not just okay, it’s wonderful. One canvas (or more) per person. Canvases are available inexpensively at local dollar stores. Any and all paint you already have: House paint, tempera paint, spray paint. Painting ‘tools’: Brushes, sticks, spray bottles, branches or whatever tickles your imagination. Paint balloons: Fun, but if the messiness of making them stops you from doing this, then don’t include these. To make paint balloons: Using a funnel to fill a pop bottle with paint. Blow up a balloon and quickly place it over the top of the bottle. Tip bottle to fill balloon, remove balloon and tie it shut. Set canvases side by side outside on the ground or against a fence. Use a tarp if you are concerned about paint damaging the area. Everyone starts throwing paint on ALL canvases using balloons, paint dipped branches and brushes, spray bottles, or simply pour and drip from the paint containers. When everyone has laughed enough and tossed enough, have people stand beside their favourite. It’s surprising how this can evolve without a fight. Each person then plays with their canvas to enhance it. Feel free to paint with leaves, branches, sticks or whatever is nearby. Let paintings dry then 1. store in the shed if really ugly. 2. use them again for the next spills event or 3. sometimes these paintings are amazing. Have each person decide what they would like to do with their creation. Nutritional Information: A very freeing painting event that encourages imagination, intuition, perceptive skills and storytelling in addition to all the other benefits of creative play. Yupo paper – available at The Art Store or Opus in pads or sheets. Watercolour paint – any kind works. 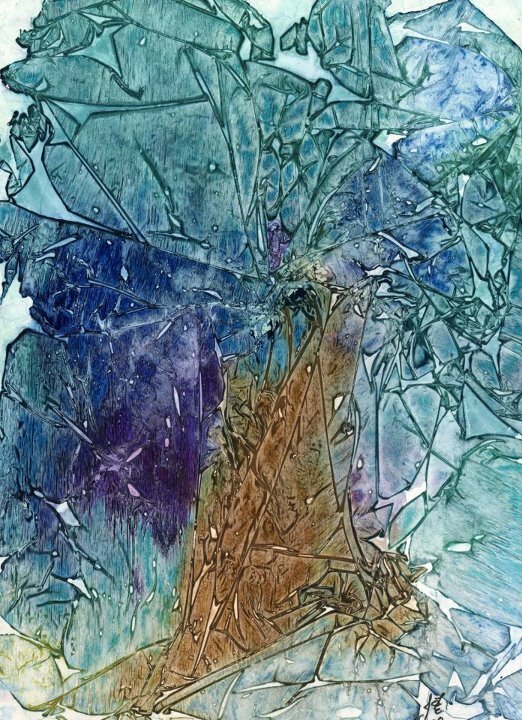 Higher quality watercolours work best but are not necessary. Plastic Wrap – Saran Wrap or Costco brands work best. If you are inclined to paint an ‘image,’ do not fuss too much as it will change quite drastically by the time you are done. Before the paint dries, take sheets of plastic wrap and lay over top of the entire painting. You can use more than one sheet if necessary. You can leave the sheets exactly as they land, or manipulate the plastic a bit to ‘move paint’ underneath. Leave the plastic sheets on the painting for 24 hours or more. Paint must be dry before removing the plastic wrap. No peeking! Even after 24 hours, lift a corner to make sure paint has dried. Remove plastic wrap and AHA! You have an intriguing landscape of patterns and colours. Have everyone look closely from all angles at the paintings. What do you see? Do you see flowers? dragons? faeries? people? What does the entire painting look like? Can you make a story up about the images you see? To use this technique intuitively: Before beginning your painting, ask a question that you would like an answer to. When the painting is complete and you’ve removed the plastic wrap, see if there is an answer to that question hidden within the painting. Posted in Creative Parenting, Creativity. Bookmark the permalink. For Momma’s.. the pressure nowadays is crazy! I came across a popular article on managing overwhelm for Moms and by the time I read through it, I was overwhelmed. Only a robot could pull it off: Every day (note: EVERY DAY) wash, dry and fold the laundry, open and file the mail, clean the bathroom, keep only one piece of your child’s artwork and toss the rest, make sure every key, shoe, toy and craft item has a place and gets put away every night, etc., etc. You get the picture; all work, no play, no time to create the life you really want: just another bit of advice in the media to add to the already insane pressures on Moms. You are supposed to feed your children locally grown organic nutritious meals and never ever pick up fast food. Your home should be clean, beautifully decorated, the yard immaculate, and your dog shouldn’t bark. Your children should be involved in dance, soccer, creative play, free play, story time, and have play dates, attend parties, be offered all learning opportunities and toys to develop spiritually, mentally, emotionally and physically… and if they act like a brat… well, it’s your fault, you did something wrong. When you do sit down and finally read a book, you feel guilty because you should be doing something else. And if you dream of living overseas with your family, or even a Disney vacation before the kids are ‘at a good age’… well, you’re crazy. You should be involved with the school and the community. Oh and of course, you should show up to your career refreshed renewed and giving 110%, ditto for your spouse whom we haven’t even begun to mention here, and you really ought to work out daily and host more get togethers with friends and family. And you wonder why you have Mommy Brain – I think it’s there to make sure you forget half of these pressures! Uh huh. Tip # 1: Do not add the ‘reduce overwhelm’ advice mentioned earlier to your repertoire of ‘must do’s’ unless they happen to sing to your soul. Tip #2: Notice when you say ‘should.’ Often a ‘should’ is society’s or somebody else’s expectations you are trying to live up to and that results in it being demotivating instead of motivating. Tip #4: Getting clearer on where you really want to be, personally and as a family, will reduce overwhelm. Tip #5 Get things done by using laughably do-able steps .. .so small they make you laugh and say “Ya, I can do that!” Honestly 2 minutes cleaning a counter is likely to happen, where 4 hours getting the entire kitchen, stove, fridge scrubbed isn’t. Tip #6. Question anything that has you thinking you are anything less than awesome. An excerpt from the full article in Kamloops Momma Magazine Dec 2011. Click here to read current and past issues! Janet L. Whitehead is a professional life coach and master creativity coach who introduces Moms to a variety of ceative tools and concepts that lead to less guilt, more fun, and inspired lives lived by design rather than by default. Posted in Creative Parenting. Bookmark the permalink. Guided Imageries – Not the Woo Woo you might think they are. Mental imagery, creative visualization, meditation, journeying– there are many names and varying techniques for this powerful tool that can relax, empower, build confidence, heal and create changes that would have once been considered impossible. In sport, elite athletes have used visualization techniques for decades. Science has shown that an athlete who knows his sport meticulously well, can visualize being engaged in the sport and will have the same results physically as if he’d been physically active. Not only will he develop confidence in his ability and visualize his success, but he will also build measurable muscle strength and blood oxygen levels. An experienced musician who visualizes being engaged in his music will show the same brain wave patterns as when he is actually engaged in the music… thus making practise possible even when there’s no instrument nearby. Years ago, I decided to practise this technique. On my last waterski runs of the season, I paid close attention to every detail, action, feeling, smell and sound. During the winter, I regularly visualized skiing. The following Spring, I skied better on my first day out than I had ever skied in my life. What surprised me even more was that I didn’t have sore muscles the next day. Already a proponent for the power of imagination, that experience helped me understand the limitless possibilities of our mind. The possibilities go far beyond success in sport or visualizing a new car. Visualization can reduce stress, break through barriers, provide inspiration, and clarify an individual’s truths, passions and answers. Visualizations have been used since ancient times by healers, shamans, and Buddhists as a method of healing and of connecting to spirit. This ability is available to everyone. So, why aren’t we all practising the art of visualization? I have come to understand it’s not as simple as the movie ‘The Secret’ would have one think. It can be hard for an individual to stay focussed and we all have unconscious limiting beliefs and barriers that can prevent us from fully experiencing the power of visualization. One of those limiting beliefs has been taught to us since our childhood. You’ve all heard this and have likely said it yourself: “It’s only your imagination.” We have a history in our culture of discrediting the power of imagination and sadly, in that process, we have disempowered what could well be the most powerful tool we have. And that is where guided imageries – visualization led by a ‘guide’- come in. • provide direction towards a discovery. The person being guided is the one who will create the experience and make the discoveries. In essence, the guide provides the pallet and brushes and helps them stay seated at the easel, while the person being guided is the one who will create the painting and reveal their unique brilliance and discoveries. Brilliant for adults, yes. But let’s not forget the children. As a child’s trusted parent or caregiver, you have an extraordinary opportunity to encourage and support what children innately already know; before the world confuses and disempowers their ability to imagine and to believe in extraordinary possibilities, and before the responsibility of daily tasks keeps them from giving any time to that powerful tool. Imagine the possibilities if your child never doubts their ability to visualize their strengths and successes– physical, emotional, mental and spiritual; if they never doubt their ability to find their own answers within; and if they have the tools for inspiration, connection to the soul, and healing. Makes it worth giving it a shot, doesn’t it? Posted in Creative Parenting, Creativity, Empowering you, me.., Random acts of Blogging and tagged creative visualization, enouraging child's imagination, guided imagery, imagination, janet whitehed, kamloops momma magazine, mental imagery, visualization in music, visualization in sport. Bookmark the permalink. You’ve gotten your children to the schoolyard, more or less fed, dressed with a touch of ketchup, slightly rumpled hair, and one child that you’ve brib… I mean,… encouraged to attend school with a promise of a bowlful of gummy bears for after school snack. You’d be feeling okay about this but then you spot THE family dancing, laughing, holding hands and hugging their mom cheerfully as they enter the building. The littlest THE child stops for what appears to be consoling. But then Ms. THE of THE Family spots you and heads your way. She glistens – hair done beautifully, make up brilliantly natural, her clothes pressed and coordinated, in contrast to the haphazard pony in your hair and the debate in your head about whether anyone at work will notice you haven’t showered or that your outfit is the same one as two days ago. And you? You just took about 53 hits to your confidence as a parent. Ms. THE only triggered a few; you added a whole domino of others. Okay, readers, which parent do you most resemble? It is likely that of all the readers, not one will claim to be like Ms. THE. A rather high percentage, though, will relate very well to the parent with the ketchup covered kids. You see, THE family does not exist. In the parenting realm of unrealistic expectations, it’s almost like we fail to notice the other parent’s hair out of place, the ketchup and spilled milk on their kids, or that she didn’t say ‘president’, she said ‘resident.’ Perhaps that’s all she mumbled as she walked by you… the rest of the conversation might be what you imagined her life to be like. And that parent who does happen to be immaculately dressed? She, too, may relate to the ketchup covered kids parent. Perhaps she’s thinking there’s nothing perfect about getting up at 4:30 a.m. to create her image because she’s terrified of leaving home unkempt. The Ms. THEs of the world may well be looking at you wishing that she had the confidence to be as gorgeously natural and relaxed as you. As a parent in the school yard, it’s so easy to compare yourself to the beautifully dressed, the always laughing, the social butterfly, the creative artist, the wealthy professional, the skinny and the environmentally perfect. 1. 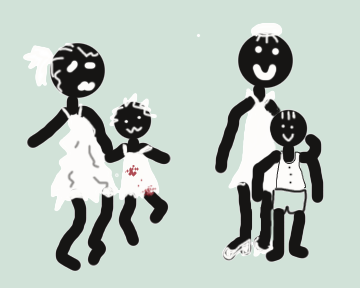 Let go the fantasy that has you thinking other parents are perfect with perfect families. They don’t exist. 2. Imagination is a powerful tool. You know you have one because you’ve used it to imagine the perfect family. Instead imagine you have a ‘thought guard.‘ This is like a bodyguard but one that fends off energy draining thoughts. Your imagined ‘thoughtguard’ could be a magnificent genie, a powerful lion or even Arnold Schwarzenegger – just imagine anything you consider to be a strong being. Start to notice when you have ‘hard on self’ thoughts and playfully imagine your thoughtguard fending off the comparisons and unkind thoughts with their magic wand, loud roar, or overpowering stance. Now go confidently, young parent, into that schoolyard armed with a thoughtguard and a repertoire of kind words for others. You will survive! Posted in Creative Parenting, Empowering you, me.. and tagged back to school tips for parents, high expectations, new perspective parenting, parenting tips, perfect family myth, perfectionism, pressure to be perfect parent, surviving the schoolyard. Bookmark the permalink. In my “shouldness,” did I hurt my daughter’s feet? 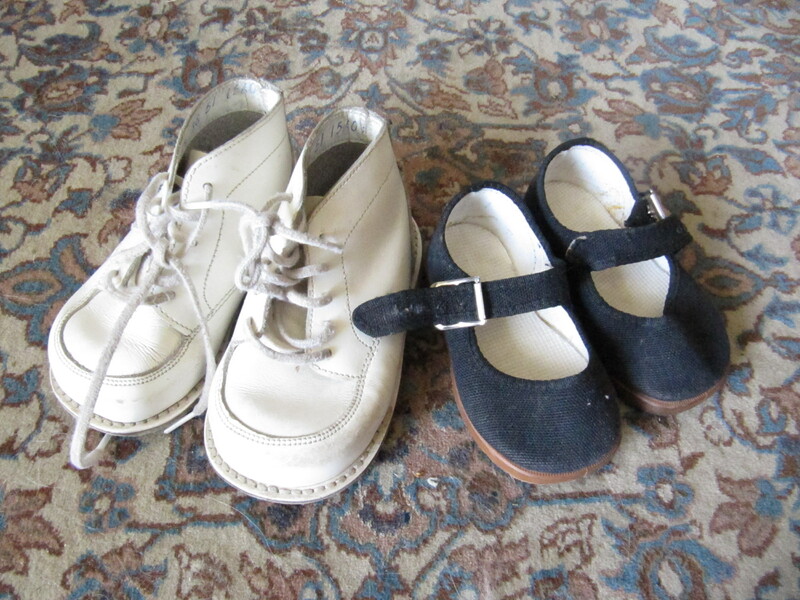 In the days when my daughters were little, the right thing to do was buy your children ‘proper’ walking shoes. They were expensive.. amazingly so, really… and they were considered an absolute necessity for your child’s developing feet. So when my first daughter turned out to be surely one of the tiniest ‘walkers’ of all times and they didn’t make walking shoes to fit her, I felt bad. I felt guilty. I searched the world over, as much as one could without the internet, to find her ‘proper’ walking shoes. I even inquired about having them made, but that wasn’t an option. I found her these little black shoes… amazed to find anything in her size that had a sole. I didn’t admit it openly, because after all I was always ‘apologizing’ when people wondered where her proper shoes were, but I thought the shoes rocked. In my gut I knew they made sense. Those little flexible soles moved with her feet, and the cotton tops seemed very comfortable. And this petite little child, who awed people by the fact that she was walking ‘so young,’ (really, not so young, just sooo tiny) walked, ran and jumped wildly in her little shoes. When my second daughter, who was more usual in size, started walking.. hallelujah! There were proper shoes to fit her! Deep down as I looked at the shoes I thought, ‘seriously?”, but I celebrated that at least for her I could pay the big bucks and give her proper walking shoes. Okay, who concocted the theory that flat bottom, inflexible soled, hard leather shoes were good for a baby’s feet? No cushioning for the bottom of the feet, no soft leather, just hard little shoes that made them walk like they were walking with boards on their feet. Imagine that. How was that good for the jumping, balancing, climbing, or even simply walking? I was conflicted.. as many parents are on many things they think they ‘should’ do: Delighted to do the right thing, concerned that the right thing wasn’t actually right. I think she ended up wearing the ‘proper’ shoes out… they were cute! And I think she ran barefoot the rest of the time. But guess which child has had problems with her feet ever since? Yes, of course, the one with the expensive ‘proper’ walking shoes. And darling second daughter? I’m really sorry about your feet. Posted in Creative Parenting, Empowering you, me.. and tagged gut instinct, intuitive parenting, letting go of shoulds, parenting tips. Bookmark the permalink.